We spent over 48 hours researching and testing 12 different types of patio heaters and found that fuel type, run time, and heating area were most important. The Fire Sense Commercial Patio Heater scored high above the rest in all categories and is our top pick. The sleek patio heater has an attractive bronze finish that looks great with any outdoor décor. The 46,000 BTUs that this heater puts out allows for outdoor entertaining even in very cold temperatures. It is easy to adjust, very easy to assemble and easy to light. The patio heater runs quietly so conversations are not interrupted. Owning a patio heater is a wonderful way to keep your family members and guests warm and comfortable when entertaining outdoors. You’ll often find that commercial and residential patio heaters are quite similar in construction and power, and indispensable tools for restaurants, weddings, barbecues, and so much more. When looking for the right patio heater for your yard or commercial establishment, it can seem quite daunting. There’s a lot out there to choose from, but all the best patio heaters share very similar features and qualities. In this guide we will highlight the very best patio heaters on the market, and what elements make them stand out from the rest. You don’t have to spend a fortune to enjoy the benefits of a high quality patio heater. Many models are quite affordable, while still being constructed of high quality materials that are designed to stand the test of time. So lets dive into the top 3 rated patio heaters on the market, and get you on the right path to choose the perfect patio heater for you. 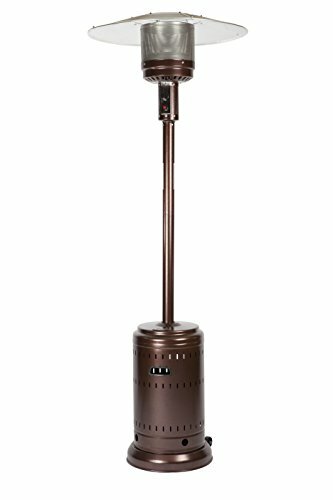 If you’re looking for a powerful patio heater, then you’ve come to the right place with the Hammer Tone Bronze Commercial model from Fire Sense. With a stunning 46,000 BTU output, and beautiful dark finish, you’re going to find that this heater is a welcome addition to any outdoor function or party, allowing you to brave the elements in even the most frigid temperatures. This is a heavy duty unit that features a Piezo ignition system and wheels that add to ease of mobility. The serious outdoor entertainer will find this heater a godsend, and it comes with a handy user manual that instructs you how to use the heater safely and effectively. You will need to assemble it yourself, but you’ll find that the manual makes it easy as pie. Customers love the easy assembly of this heater, and how all the parts are always present upon arrival. In fact, this heater is known for its quality shipment condition, and once out of the box, you can have it fired up in no time. Easy to light and adjust to the right temperature, the heater can emit a serious amount of heat. High enough to be safe for even party guests who are quite tall, you’ll never have to fear any kind of fire hazard with this heater. The unit runs quietly, and the burner lights evenly with a charming blue flame that lets you know that it’s doing its job. The quality of construction here is quite high, and the fine bronze color adds a touch of class that other heaters don’t have. All in all, for the price you’re paying for this heater, you’re getting a tremendous amount of performance and fine design. If you’re someone who entertains a lot outside, then you’re going to find that operating this heater can take your outdoor parties to a whole new level. Guests will be so pleased when they have a dependable source of outdoor heating that keeps them warm without burning them up. This is a professional-quality outdoor patio heater that is crafted from only the finest materials and works with practically every kind of outdoor decor. Coming in at just over 7 feet, the heater is constructed from only the most durable materials, and its premium hammer bronze finish is resistant to rust, fading, and corrosion of any kind. This is the perfect outdoor heater if you live in an extreme climate, because it holds up so strong against the elements. There are wheels on the unit for easy portability, making it simple to use in multiple locations such as by the pool, on the patio, at a restaurant, at a party or wedding, or pretty much any kind of outdoor event you can imagine. With its incredibly efficient stainless steel, infrared heating equipment you’re going to enjoy a stunning output of 41,000 BTU, giving you comforting and radiating heat that spans over a wide radius. This heater generally expands to a 15 food diameter warming zone, meaning that you’ll need to purchase less heaters to get the same expansive heating results. There’s a single heat control knob and handy piezo push-button ignition system that allows for fast and simple operation of the unit. Also, with the anti-tip design, you can be assured that the heater is incredibly safe to use in various different weather conditions. All the accessories that you need to operate this unit are provided in the box, such as the heavy duty LPG regulator, the pre-attached flexible hose, the premium weatherproof head, element cover for storage, and so much more. All you’ll need to supply are your own propane bottles and fuel, and then you’re ready to go. Lastly, the unit provides you with a pilot light system for safer startups and shutdowns. Compliant with all ANSI, CE, and CSA standards, you can be guaranteed that you’re getting a heater that is safe, and can stand the test of time. This Havana Bronze commercial heater from AmazonBasics features a fine 46,000 BTU output for all season warmth, no matter when you choose to entertain outdoors. This is a well-loved outdoor heater that is exceptionally powerful, delivering soothing warmth that makes your guests as comfortable as possible, even when the temperatures dip significantly. 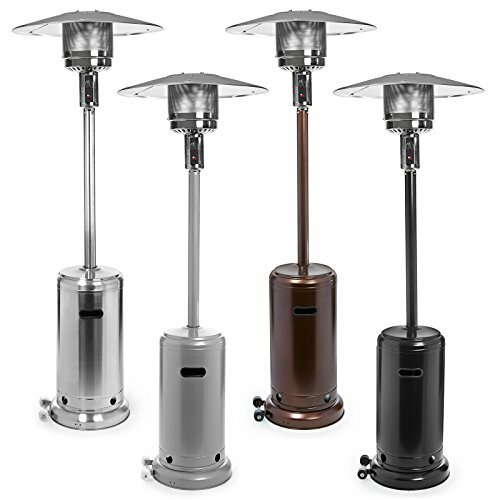 Should you be an aficionado of al fresco dining on your back porch, of if you are into swanky cocktail parties on the veranda, or even if you just want to sip hot cocoa and stare at the stars, you’re going to find that owning a patio heater of this quality will be the perfect solution to maintain your comfort level. This unit features an incredibly sturdy base that allows for secure placement and advanced stability. The base reservoir system can easily be filled with sand or water, giving you a nice low, heavy, and secure base that will hold strong even during windy conditions. As with any patio heater, it’s important that you read the instructions before use, so that you know how to properly operate and maintain the heater for the utmost performance and longevity. Enjoy such features as the safety auto shut off tilt valve, and the AmazonBasics 1 year limited warranty that protects you from any manufacturer defects. One of the hallmarks of this heater is the start-up piezo ignition system, which is powerful and efficient. Begin with a 20 pound LP gas cylinder, then all you need is a light to get the unit up and running. With the push of a button, you’ll enjoy marvelous heat that lasts hours after hours. You also get a heat control knob that allows you to adjust the heat to the perfect level. Should the heater be accidentally tipped over, it will automatically turn off thanks to the shut-off tilt valve. Finally, with the handy wheels for easy mobility, you’re going to see that this heater is the way to go when you’re frequently entertaining outdoors. The products mentioned above are the top rated patio heaters on the market, and they’re customer favorites for good reason. All of these models are affordable, safe and effective, and give consumers the opportunity to create a convenient source of heat wherever they need it. You can easily purchase one of these heaters and be confident that it will provide you with great results, or you can continue your search and consult the Buyer’s Guide to help you find another model that might be just right for you. No matter what patio heater you choose, you’re going to love just how comfortable you can be outdoors, even when the weather is a bit more frigid. There’s nothing more pleasurable than entertaining, but it’s always important to keep your guests as comfortable as possible. Operating a patio heater not only creates comfort, but it creates a beautiful ambiance that all your guests will enjoy. Having a fine outdoor heater is a sign of hospitality and generosity. Whether you seek to own a heater for your home or business, the model that you choose becomes an extension of your establishment. For patios, restaurants, pool areas, backyards, and so much more, owning a heater can add to the overall comfort and enjoyability of various social events. Just because summer has come and gone doesn’t mean that the party has to end, and that’s why finding the best patio heater for your space is a smart investment. When you find the perfect patio heater, you’re going to see that it not only provides comfort, but also an attractive centerpiece that adds ambience to any event. There are so many different types of styles, fuel, and various other considerations to take into account before you purchase a residential or commercial heating unit. Before you make your purchase, consult this Buyer’s Guide to help you make an informed decision. We’ll explore the various different types of heaters, how they might benefit you, and what features you perhaps want to consider. Low-maintenance Operation: Owning a patio heater is quite convenient, and it takes very little effort to operate and maintain the unit. Most heaters come with a handy instruction manual that shows you how to use the heater to maintain its longevity over time. Usually with a few simple steps, and one-button operation, you can effortlessly turn the unit on and off, or adjust the temperature to your liking. Silent Heating: One of the most remarkable features of these patio heaters is that they run silently. This is great for parties where there is a great deal of conversation happening, or restaurants when diners want to enjoy their meals with fine conversation. The silence of a patio heater makes it perfect for all social events. Attractive Design: Patio heaters are aesthetically pleasing because they’re tall, slim, and feature fine materials. They do not take up too much space and they are not hard on the eye. When someone sees a patio heater, they feel that it adds to the overall ambience of an event. No Air Quality Issues: Unlike operating a fire pit or fireplace, a patio heater will provide you with warmth without the air quality issues and maintenance issues that you deal with otherwise. It’s hard to maintain a fire all night long, and guests often complain of the smoke. With a patio heater, you simply don’t have to deal with these concerns. Built for the Elements: What really makes patio heaters so handy is that they’re built for the outdoors, and are rugged in construction. You can be confident that it’s ok to keep the heater outside in the rain, wind, or sleet, and throughout the seasons, the patio heater will maintain its performance and integrity. Just a brief note on the fuel types that are associated with a patio heater: In general, outdoor heaters use 3 different fuel types. There are various elements that will make one or another of these types appropriate for you. A good natural gas heater will offer you continuous heat with very little maintenance, and that’s why they’re one of the most popular versions today. All you need to do is attach the unit to the natural gas line and you’re up and running. These units are also less expensive to operate than the propane version, or the electric gas heaters, and they’re also more efficient. You’ll find that natural gas models come with an included gas line that can be quickly hooked up for dependable and consistent heat. The only disadvantages to owning a natural gas heater are that you may need a plumber to help you set up the lines, and once the lines are connected, it will be more difficult to move them around as you would be able to do with a propane heater. On the up-side, most of these models will come fully-assembled and can heat an area of up to 20 feet in size. Propane gas heaters are one of the most commonly used for the outdoors because they’re simple to operate and provide almost instant heat. All you will need with one of these units is a gas tank, and the unit is easy to install on your own. You can find models that are already fully assembled, and you can select a unit that use domes to spread heat up to 20 feet around. The disadvantage to owning a propane heater is that you have to replace the gas tanks, which could possibly run out during an event. Keep in mind that when you own a propane gas heater you will have the additional cost of replacing and maintaining the tanks. An electric patio heater provides you with a tremendous amount of convenience, as it quickly adds heat to your patio and deck with very little effort. Most of these heaters require a 120-volt outlet and will use a heating bulb to create warmth. The majority of these will use a standard residential outlet, and it’s possible to plug them in almost anywhere you want them to be. Electric heaters are remarkably convenient because they’re low maintenance, especially in comparison to gas heaters. Another great advantage here is that electric heaters can be used in covered or partially enclosed spaces, unlike propane heaters. The only downside to an electric heater is that you have to plug it in. Many outdoor spaces don’t have access to plugs, and sometimes using long electric cords can be unsightly. Also, an electric heater does not have that marvelous flame effect that adds to the ambience of an event. Customers really appreciate the look of the flame in commercial settings, at weddings, etc. So, even though electric heaters work so well, and are wonderfully safe, they rarely become the charming centerpiece of social interaction that propane and natural gas heaters will become. Standalone Heaters: This type of heater, also known as a ground heater, is the most common type of patio heater. This is often used in commercial spaces, and it’s generally tall, thin, and gives off a large amount of heat. Ideal for outdoor decks and patios, this heater is often used in event spaces, hotel pool decks, and in restaurant settings. Tabletop: This model looks like a miniature floor heater, or it can look like a traditional lamp. Sometimes it is referred to as an outdoor heating lamp, in fact. These models are ideal for side tables or large tables in event spaces, and usually are about 3 feet in height. Mountable: These outdoor heating units can be mounted to a wall or ceiling, and are versatile in use. They usually come with a stand, and they allow you to save floor space and add heat to industrial and work spaces. The power of a heating unit will be measured in watts or British Thermal Units, otherwise known as BTUs. Most models will list their heating range as a number of feet around the unit. Take for instance electric heaters that offer up to 1200 watts of power, meaning that they warm up to 12 feet in a circle around the unit. BTUs are considered the standard measurement for most of these appliances, and the BTU will be written as BTU per hour on the model. The higher the BTUs, the more heat the unit will give off. Should you be purchasing a propane gas heater, you’ll want to take a look at the gas tank size. Smaller tanks will need to be replaced more often, whilst larger heaters will utilize bigger tanks which will run for longer. Purchasing a model that uses a 20 to 40 pound tank means that you’ll experience hours of continual heat. Before you install your outdoor heater, there are some safety considerations that you need to take into account. Natural gas and propane heaters are intended for outdoor use only. There are some electric heaters than can be used in semi-outdoor spaces. Make sure your outdoor heater is placed on a level surface that can hold its weight safely. Never place an outdoor heater in an area where there is a lot of wind or close to any low-hanging tree where it might create a fire hazard. Always check the clearances to combustibles as well as wall clearances that are offered by the manufacturer. You’ll find this information in your owner’s manual. Do not ever hang clothing or any flammable materials on or around the heater. Make sure to turn the heater off before doing any maintenance tasks on the unit, or when moving it from location to location. There are a number of safety features to keep in mind when you own a patio heater. These features will be built into the unit to ensure that you’re safe from fire and other risks associated with owning one of these devices. Automatic Shutoff: There will be a switch inside the unit that will turn the heater off if it gets too hot or if there is any kind of fire hazard within the unit. Tilt-Over Protection: This great feature ensures that you’ll be safe if the unit is knocked over. The heater will automatically turn itself off in this situation. Cool-Touch Glass: You’ll find that most commercial heaters will come with a cool-touch glass that makes them perfectly safe to use around children and pets. Safety Approvals: You want to look for heaters that have been approved for safety by UL and CSA. This kind of approval means that the product has been evaluated to ensure that all the safety requirements have been met. When it comes time to clean your outdoor heater, you simply need to wipe the surfaces with water and a mild soap using a damp cloth. Never use abrasive cleaners or oven cleaners, as these can damage the unit. It’s important to take a look at your owner’s manual to learn about the specific cleaning requirements that pertain to your unit. When it comes to maintenance, you’ll love that there is actually quite little maintenance required for a standard patio heater. This is one of the biggest advantages to owning one. With the occasional wipe down, the only other maintenance you’ll have to perform will be to replace gas tanks on propane heaters. Assembly: There are various assembly-types that you’ll find on the market, and most outdoor patio heaters will come at least partly assembled already. There are many models that will come fully-assembled and in one box. All you have to do with these is attach the dome for the model, and you’re ready to go. This is a good model to purchase, because you’ll find that building a model that is unassembled can take a lot of time, and be a bit complicated. Purchasing a fully-assembled patio heater will add convenience and simplicity. Electronic Controls: When you purchase a model that has electronic controls to adjust heat levels and turn the heat on and off, you’re adding a great deal of ease to your experience. You want to look for a patio heater that features a one-touch ignition and simple setting controls, or even find one that has a handy remote control for ease of use. Adjustable Flames: You’ll find that most propane and natural gas heaters will come with some type of flame, and these flames can be adjusted to your desired heat level. Having this kind of flame greatly adds to the ambience that the heater provides. Length of Warranty: Should your heater have a long warranty, such as up to 5 years, you’re going to gain a great deal of peace of mind, while being confident in the quality of the materials used. You can also be confident that the model will stand up to tough environmental conditions throughout the years. There’s nothing better than a fireplace or fire pit for an outdoor social event, but for many situations, these simply aren’t convenient and can be quite dangerous. That’s where the patio heater comes into play. Fire pits add a great deal of ambience to your event, however outdoor heaters use real, adjustable flames and provide elegant designs that enhance your event in the same way that a fireplace would. Outdoor fireplaces can be quite messy, and they require a great deal of cleaning and maintenance. When it comes to using a patio heater, you never have to worry about wood, ashes, or other messy components that would otherwise be a burden. Owning a patio heater is a wonderful way to keep your family and guests warm, while adding ambience and class to any social situation. There are so many models of patio heater to choose from, and it can be daunting narrowing it down. The above Buyer’s Guide is meant to help you zero-in on what features and styles that might be best for you. Once you purchase a patio heater, you’re going to be delighted with how well it stands the environmental elements it faces, and how much warmth it can add to your gatherings. There are so many benefits to owning a patio heater, and one of the best benefits is that it requires so little maintenance. Once you have the heater installed, it practically runs itself. With simple one-step operation, and easy heat adjustment, you’re going to see that even your guests can adjust the heat on their own without having to ask you for assistance. Create convenient heat wherever you need it most, and see just how enjoyable your outdoor events can be, long after Summer has passed.